Quantis not only knows how to measure environmental impacts, we also know how to effectively communicate the results! The AccorHotels environmental footprint report is just one recent example of the companies that are looking to Quantis to build their fact-based sustainability stories – others inlcude Nespresso and UEFA EURO2016. AccorHotels, a global leader in the hotel industry, believes that robust environmental impact measurement is key to a better understanding of their activities and allows them to make sound decisions about how to render their operations more sustainable. AccorHotels chose Quantis to perform its corporate footprint which provided a solid foundation for its strategic sustainablility planning. 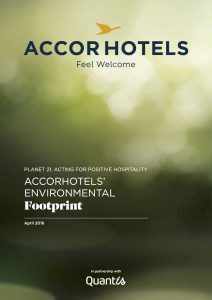 Based on the corporate footprint project, Quantis partnered with the group for the April 2016 report: “Planet 21 Acting for Positive Hospitality: AccorHotels Environmental Footprint”. In an effort to widely engage AccoHotels’ stakeholders, the report translates technical results into an intelligible and dynamic story. Quantis carried out a multi-indicator study by measuring the group’s carbon footprint, water consumption, impact on biodiversity but also marine and freshwater eutrophication and local water scarcity. This study has been performed on the value chain of the Group, which is active in 92 countries and counts some 190,000 employees and 3,900 hotels. The study allowed AccorHotels to understand and identify primary leverages. In the April 12th 2016’ press conference, AccorHotels has announced its new sustainable strategy for the coming years. Providing results is not an ultimate goal. But crafting a dynamic, fact-based story around the number drives engagement. The report highlights and makes accessible complex results and provides strong engagement for AccoHotels stakeholders. If you wish to see more, the report includes some good infographics (made in Quantis). You can also read the full report here (english and french). For more information on the project or on our Sustainable Communication Services, contact Thibault Compagnon or Dimitri Caudrelier, Managing Director, Quantis France.